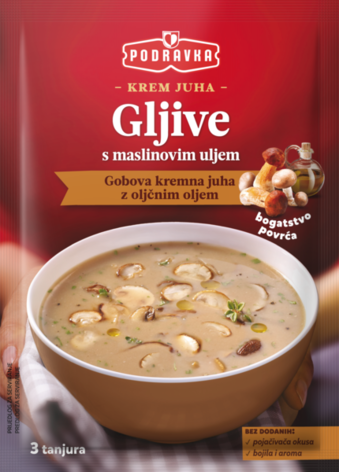 When you add a few drops of the finest olive oil to the fragrant porcini mushrooms and champignons, what you get is a fabulous soup combination. Apart from abundance of mushrooms and olive oil, the soup contains celery, potato, onion, tomato and aromatic spices to add even more vegetable taste. Without artificial colours, aroma and flavour enhancers - what you will get is a creamy perfection of natural, harmonious and tasty ingredients! Preparation: Empty the bag contents into 750 mL of cold water. Stir with a whisk until the soup boils. Simmer for 5 minutes stirring constantly. Ingredients: skimmed milk powder, corn starch, wheat flour, dried mushrooms 11% (6% porcini mushrooms, mushrooms 5%), palm oil, dried vegetables 9.6% (potatoes, onions, celery, tomatoes), table salt, maltodextrin, yeast extract, lactose, olive oil 1%, spices, milk proteins, Lovage leaf, parsley leaf, thyme. May contain eggs.